What’s not to love about plucky little Seoul Plaza? For budding David Changs this Korean supermarket is the place to get your gochugaru (red pepper powder) and brine shrimp for making home-made kimchi, and your gochujang and ssamjang for bo ssam. There are also aisles for Chinese and Japanese ingredients, including a reasonable selection of fresh Chinese vegetables. You can pick up a decent Pi-Xian chilli bean paste here for fish-fragrant aubergines or mapo tofu. Those back from Japan with a hankering for Pocari Sweat will find it in the fridge, along with those weird drinks that look like they have frogspawn in (nope, never tried). If you can’t be bothered to make your own kimchi, you can also choose from their freshly-made options. In the past few weeks, perhaps most excitingly for those desperate to find food in Selly Oak, they have started a hot food counter, serving takeaway rice, noodles, Korean fried chicken, fried dumplings, vegetable and pork dishes. The Korean fried chicken has a decent crust and decent sauce. A great deal for under a fiver. This is rapidly becoming our canteen for trips out from University campus. They even have a small section for crockery and homewares, I got some nice Korean clay rice bowls here, perfect for serving kimchi jiggae. You can even pick up a rice cooker while you are there, or even an authentic Korean dedicated kimchi fridge, a snip at £700. Seoul Plaza, 536 Bristol Road (down from and opposite Aldi), Birmingham. 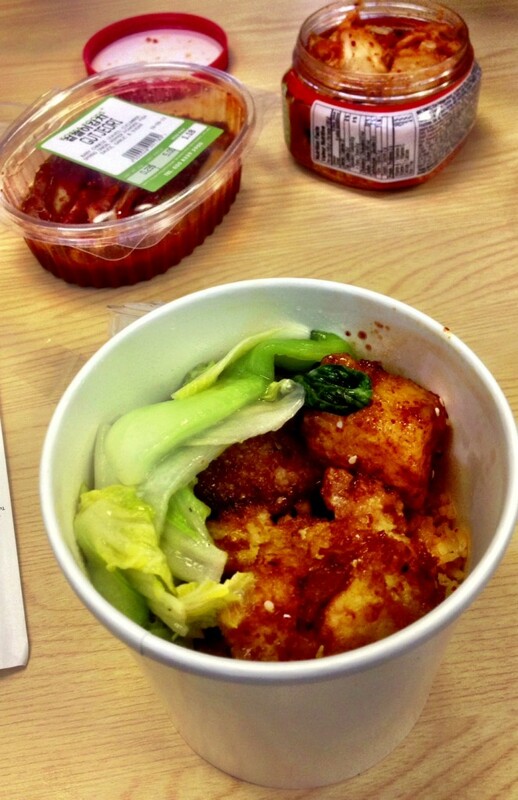 Bowl of takeaway goodness from Seoul Plaza! My new lunch! You can get a small tub of Korean fried chicken wings for £1.95. So moreish I swear they’ve been laced with crack cocaine!